ClickCaption is a free program which is presented as a good study tool. The program allows you to highlight any text and get information about the text from the Bing search, Wikipedia, and some other websites. The information is shown in a separate pop-up window, which is supposed to ease your browsing sessions because you do not have to access a separate window, go to a search engine, and type in any search terms. The ClickCaption program is available at clickcaption.com and may also be bundled with freeware program, including Plus-HD. In order to prevent additional program, you should not hurry to install programs but review the license agreement and other information provided by the installation wizard. 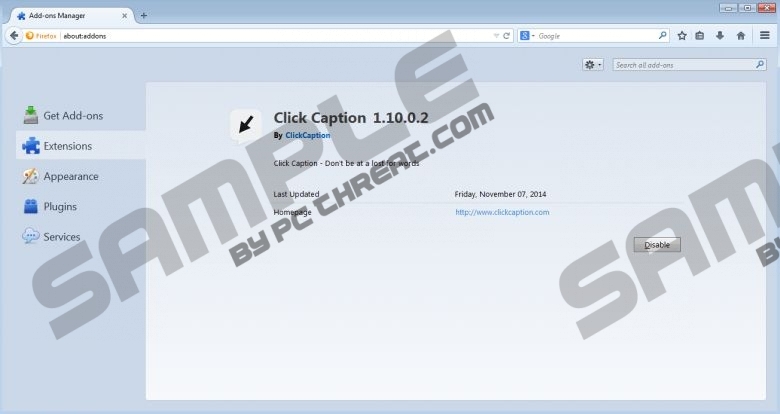 The ClickCaption program does not create any browser extensions or browser add-ons but works on Internet Explorer, Mozilla Firefox, and Google Chrome. It is also worth mentioning that ClickCaption is very similar to Quicknowledge, Highlighty, and SearchSnacks, all of which offer almost identical services and are capable of displaying third-party advertisements. We recommend that you remove ClickCaption from the computer as soon as you can because this seemingly harmless program is an advertising-supported program. ClickCaption is capable of displaying third-party advertisements, which are displayed on shopping websites. ClickCaption may display pop-ups, web banners, coupons, in-line advertisements, and other types of advertisements. All ClickCaption ads are supposed to help you find the best deals, but note that some of the ads may have nothing in common with the underlying website or your search terms. Moreover, ClickCaption is not liable for the content of the advertisements displayed, and, by installing this program, you accept responsibility for your interaction with ClickCaption ads. The sooner you remove ClickCaption, the better, because ClickCaption is capable of monitoring your online behavior. It automatically records your clicks, impressions, search terms, browsing history, type of the browser, and some other non-personally identifiable information that can be useful for creating targeted advertisements and implementing new advertising strategies. Hence, we encourage you to remove ClickCaption from the computer, and the sooner you do it, the better. Our instructions below should help you remove ClickCaption, but we recommend that you implement SpyHunter. This real-time security program will easily remove the unwanted program and safeguard the system against multiple threats, including browser hijackers, Trojan horses, rogue anti-virus programs, ransomware infections, rootkits, etc. Select Uninstall a program and uninstall ClickCaption. If you want to be sure that all the files of the unwanted program are deleted, you should implement a reputable scanner. Use the scanner available below, and invest in the program if need be. Quick & tested solution for ClickCaption removal.